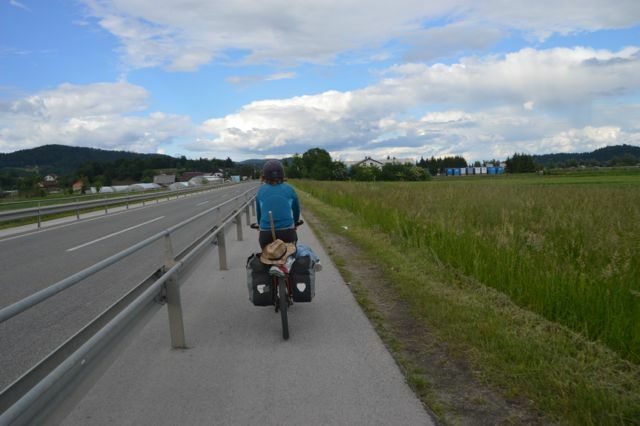 The border for Slovenija snuck up on us as we were too busy enjoying the riding to notice how quickly the kilometres were passing. 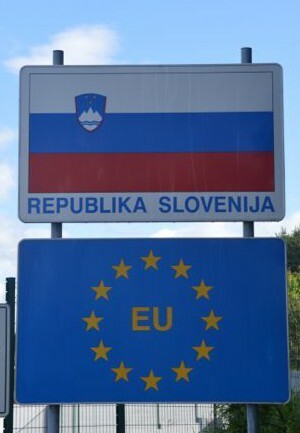 A small back road led to the large border patrol area that divides the Schengen zone of Europe from the rest of Europe. Turns out there are a myriad of zones in Europe, each with different functions and reasons, and we were just getting our heads around it. There is the European continent with all her countries, there is the European Union which includes a majority of European nations but not all, there is the Euro zone which is based totally on currency, there is the Schengen zone based upon border protection, and the borders for all of these zones are different. 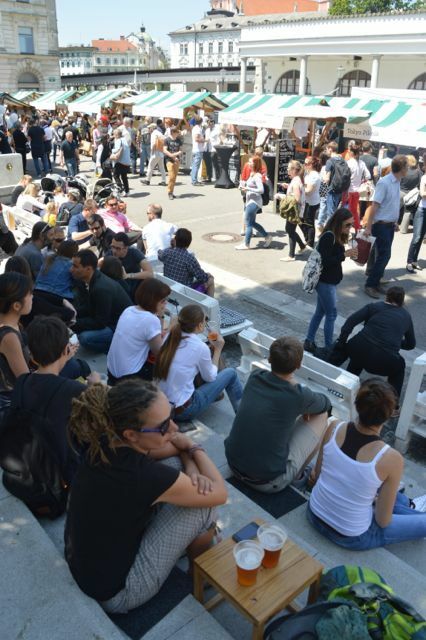 We had recently learned that we could only stay for a total of 3 months in the Schengen countries during a 6 month period. That’s 3 months to travel through 20 countries and then you must be out. The border official eyed our Australian passports with scrutiny and after checking with his boss that we were on the list of ‘okay’ nations we were waved through. Our three month countdown started now. 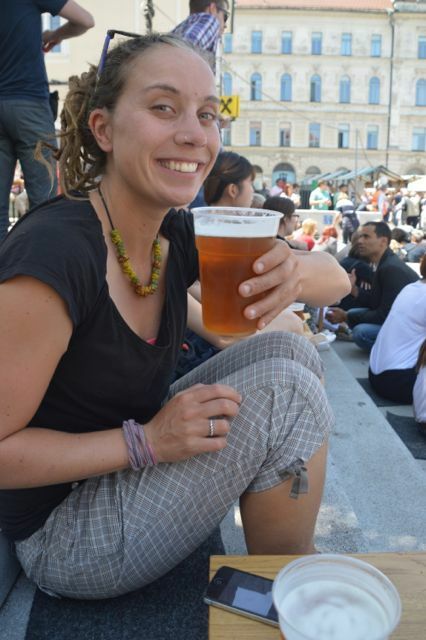 We had chosen to try and push the whole way to Ljubljana that day, as we were excited about catching up with our lovely friend Spela. The distance was similar to what we had covered the previous days, but the wiggly lines on the map left us unsure of how quickly we would actually get there. It was time to find out. 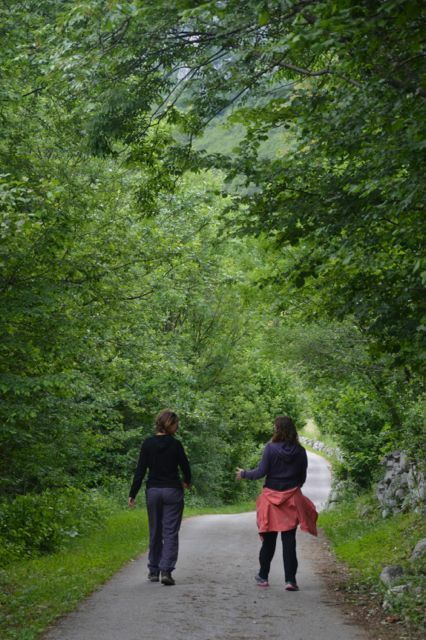 The road narrowed down and quickly dove into a lush green forest. 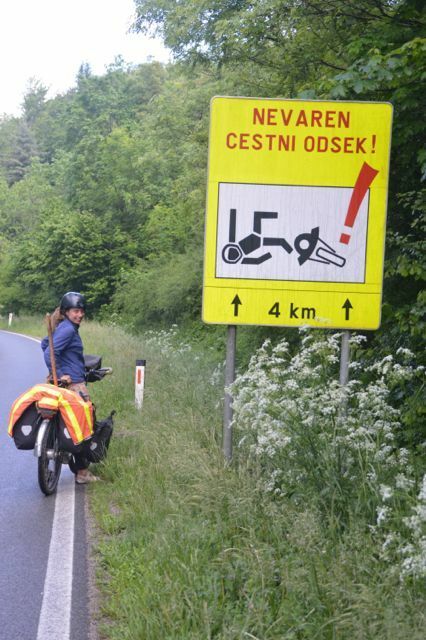 We soon realised that Slovenian drivers are far superior to their Croatian neighbours. Within an hour I felt relaxed and began to ride less defensively. 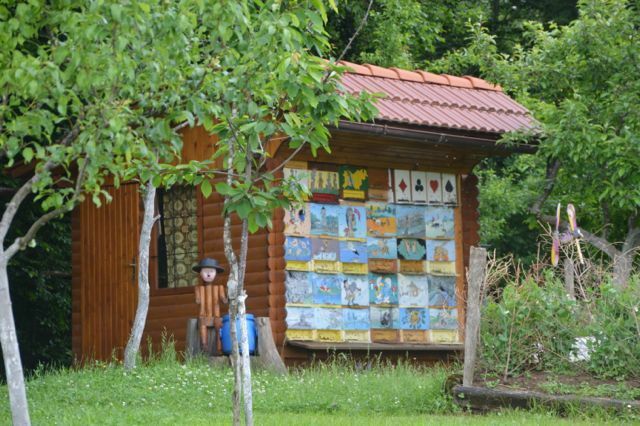 Each little village we cycled through was more adorable than the previous. The forests that divided them were full of spring blooms and birdsong. Such enjoyable riding built up my hunger and for some reason I started to dream about omelettes. We pulled over in the next town and hit up the Lidl for supplies and cooked up an egg-straviganza. More deer signs, unfortunately despite being a country with bears we saw no bear signs. One also needs to look out for falling motorcyclists. First tea/coffee break of the day. The much needed omelette break. We still had a way to go and the lady at the tourist info centre let us know that a train that takes bikes regularly goes to Ljubljana. 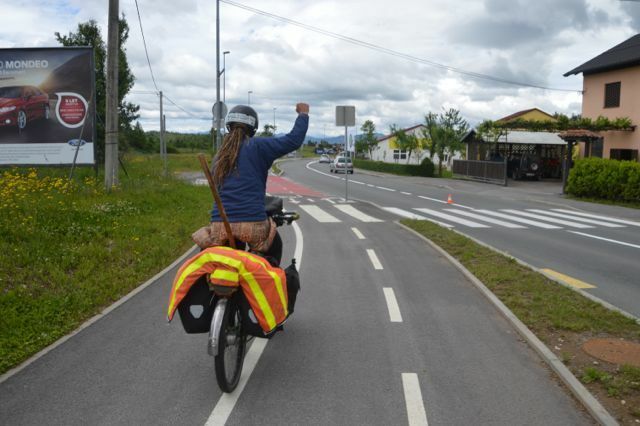 Did you read that – a train that takes bikes… It was tempting but we chose to continue on. After a little more undulating the first squiggle on the map began and it was straight down into the valley below. We covered the kilometres in no time, free wheeling and laughing the whole way. In the valley we meandered along the backroads, the fields full of irridescent pink, yellow and purple flowers, the green of the grass glowing in the sunlight. For every hill we climbed we were rewarded with large sweeping downhill sections and by late afternoon Ljubljana was within our sights. We shoved a few more pastry treats into our mouths and pushed on. To our delight a dedicated bicycle path had been (mostly) built for the last 20 kilometres into town. I was quickly falling in love with this country. Stunning views – no not me. Fields abloom with spring flowers. Needing a rest from too much downhill. The magical bike path into Ljubljana. Arriving at Spela and Anita’s apartment that evening was magical. 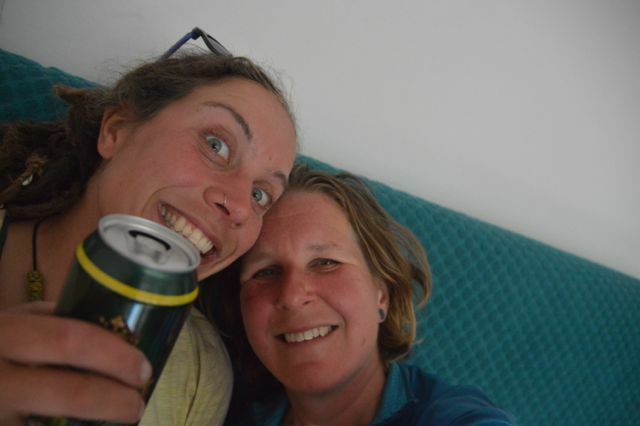 The hard riding of the last few days was forgotten as we shared a celebratory beer and then washed away the thick layer of sweat and dirt in a hot shower. Later we shared food, wine and stories of what has happened in our lives since we last saw each other over a year ago. As you can imagine there was a lot to talk about. 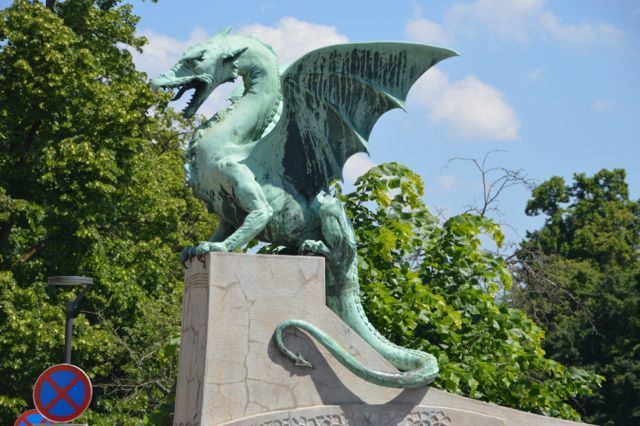 The next day we were given a royal tour of Ljubljana – we wandered her streets, gardens, canals and markets, we drank her delicious beers, tasted her delectable food and ended the night with a wander up to the castle battlements to see how the lights of the city twinkled below. Excited to have made it. Looking and feeling tired, but not enough to skip a celebratory beer. 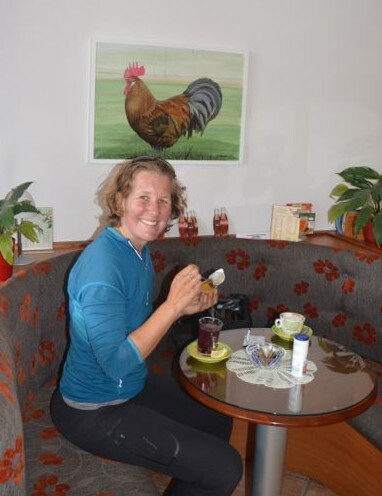 The following day we caught a bus to Spela’s hometown of Bovec. 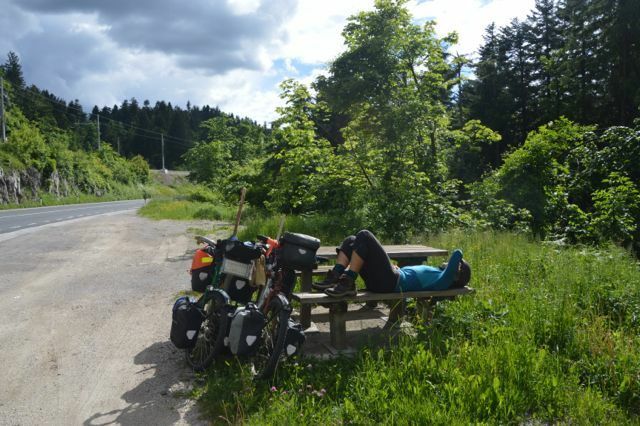 What no one tells you about cycle touring is that one of the side effects can be the development of motion sickness as your body has learnt to travel across this world so much slower. 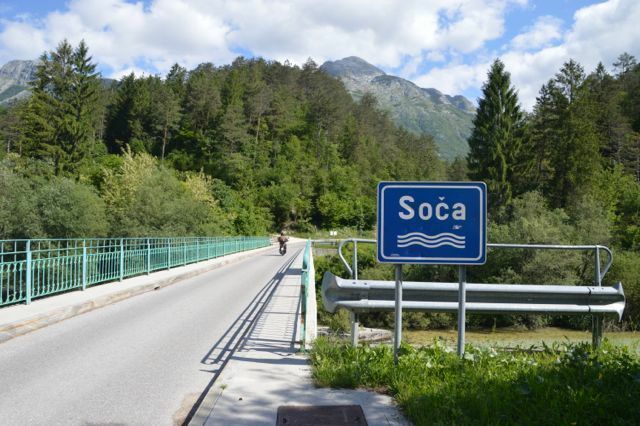 Needless to say we both suffered as the bus sped through to the town of Idrija where Mercury was first discovered and mined, before it wound its way through the Soca River valley. The scenery was jaw dropping and I think we both secretly wished that we were riding along that road instead of being stuck sick in a bus. 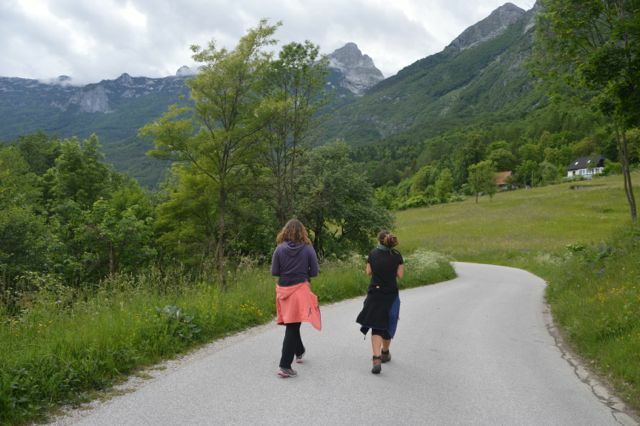 The silver lining at the end of the cloud was Bovec and the haven that was Spela’s parent’s home. We were treated like family from the word go and were spoilt with kindness and Spela’s mum’s incredible cooking. Spela and Jude on an evening walk. Looking for tasty forest food. Sharing knowledge about the healing properties of everything around us. Relaxing at the water’s edge. So much natural beauty here. 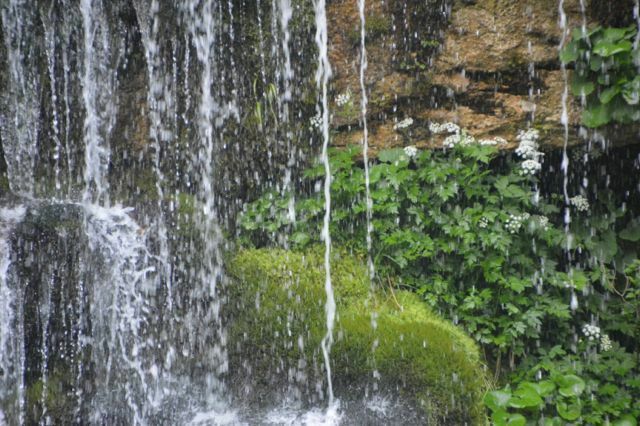 Yep, it’s a close up of a waterfall. Excited to be at Spela’s parent’s home. There are a myriad of beautiful walks that start at their doorstep and we took full advantage of such glorious sunny days as we had. 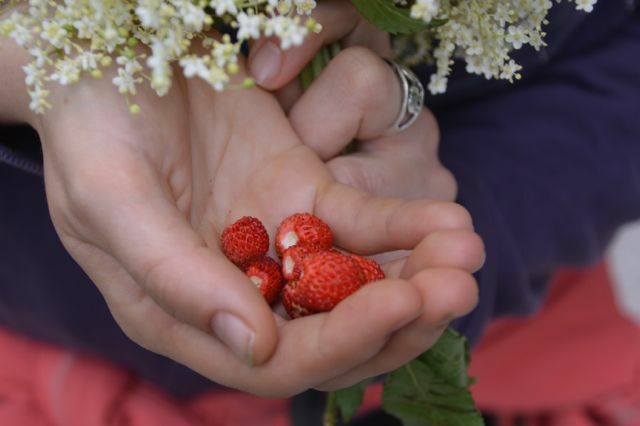 As we walked we picked wild strawberries, savouring the burst of intense flavor that came with every mouthful. 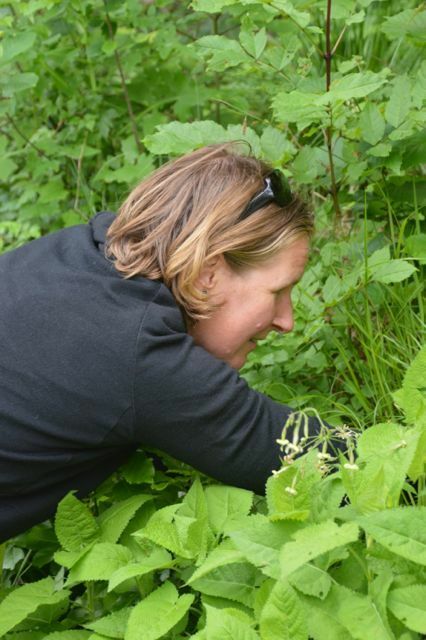 Spela pointed out and picked whatever plant she recognized for either its edible or medicinal qualities. 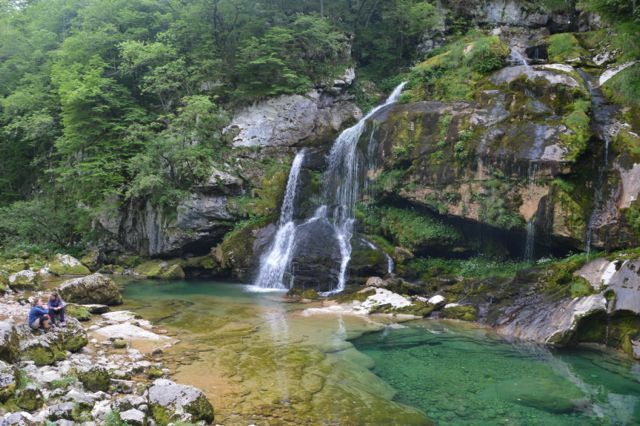 Waterfalls captivated us as their waters crashed into the azure blue pools below. 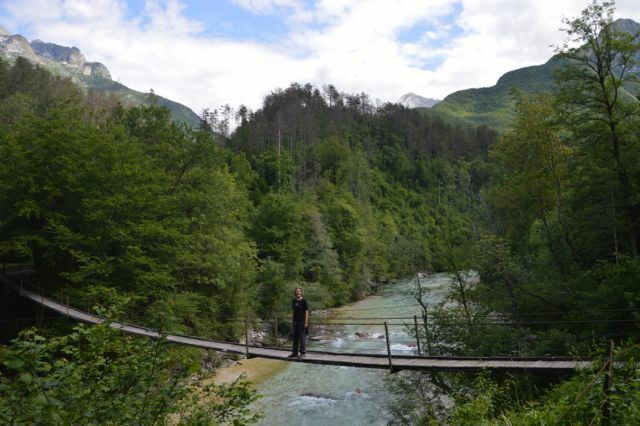 We meandered along the edge of the Soca River following her well-worn path through the mountains. Back at home we dipped the elderflowers that we had picked into a batter and fried them sweet tempura style. 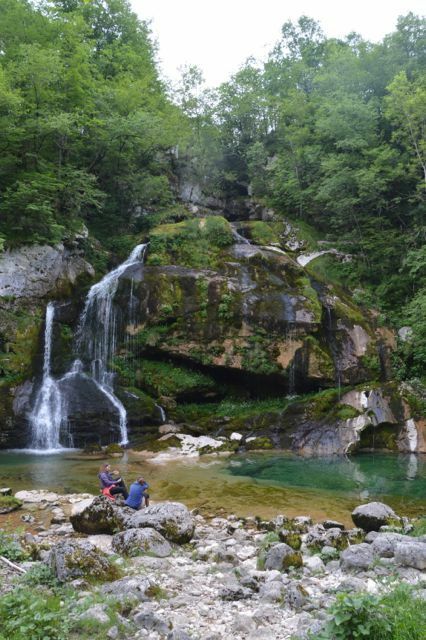 My love for Slovenija was growing deeper by the day. If only every day could be this perfect. A nice stroll through the forest. 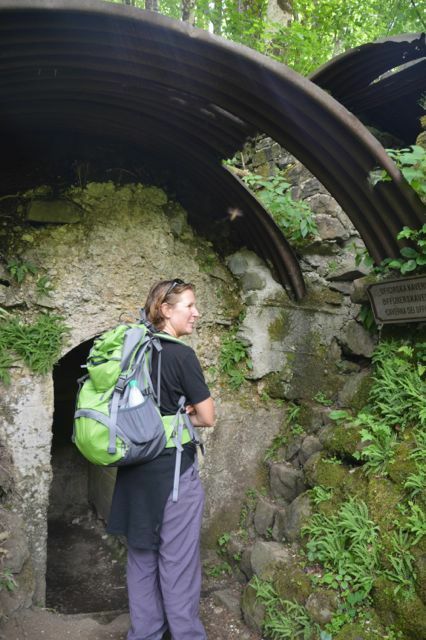 We even found the bunkers from the first world war. 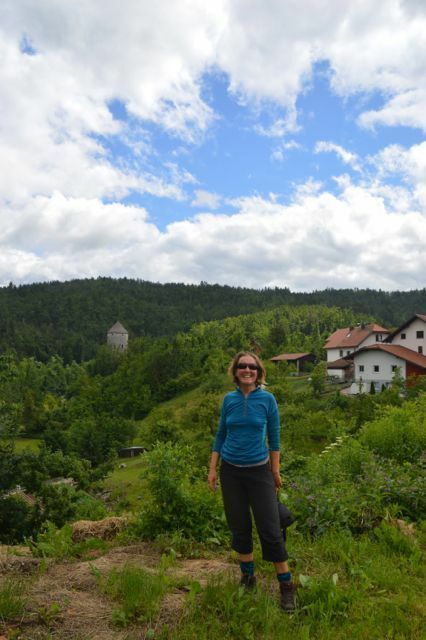 Excited about Slovenija, or doing some yoga. We caught a ride back to Ljubljana with a guy who worked for the bomb squad and was a DJ to boot. If that wasn’t cool enough, the quickest way back was to actually drive for 30 minutes through Italy on the way home. The scenery was draw dropping and I was planning our cycle tour through the area within minutes. Back at home while Spela and Anita were packing for their hiking trip to Portugal, Jude and I were deliberating our future plans. Big changes and a difficult decision was afoot. Our destination of Glasgow, for this leg of the trip, no longer seemed relevant now that we were going to be working in London as paramedics. Could we change it now? What would changing it mean? Did it really matter if we changed it? In our goal driven society such a change would be almost seen as a failure, but our journey has taught us that better options can present themselves, change is a constant in life, and to let go of things that are no longer useful or relevant is healthy. It took a few days of soul searching but with peace in our hearts, we finally decided that our new home was going to be London, so it made sense to ride there. Sorry Glasgow but you will have to wait for another day. As I mentioned, Spela and Anita were heading to Portugal for some hiking. 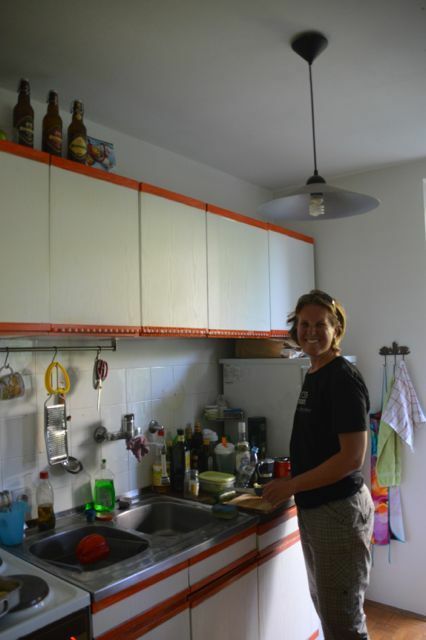 They offered for us to stay in their flat for as long as we wanted, and the idea of having a home for a few days appealed. We pottered about doing things everyone at home takes for granted. We also lay under trees in the parks reading books and meditating, we tasted some of the best Slovenian cuisine and beer at the Open Market run on Fridays in the centre of town, we bought new panniers of clothes at a charity shop that was selling everything for 2 Euros, we cycled through the streets smelling the spring flowers and looking at the graffiti, and doing this we found the first place outside of Melbourne that we could see ourselves living in. Reading, one of may favourite day off activities. Loving a Slovenian micro-brewed beer. Pity it has to be brewed in Austria due to government protection of the two big multinational breweries. 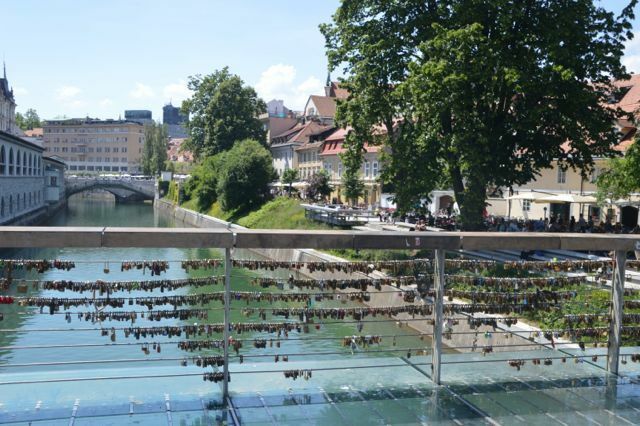 Padlocks on the bridge of lovers. It was hard to drag ourselves away from our home for the week. 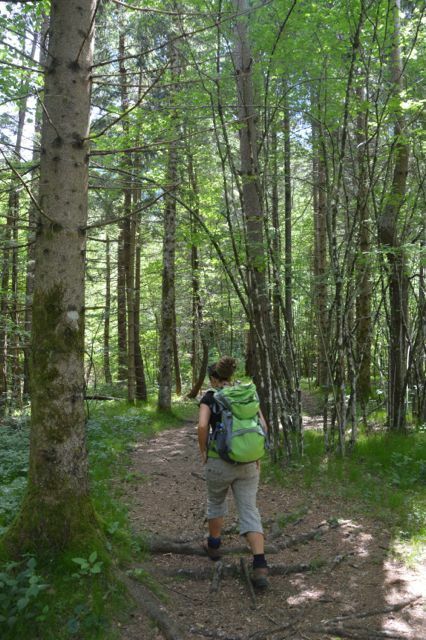 Having a base for a while was lovely, but the road was calling and we longed to be in the wilderness again. 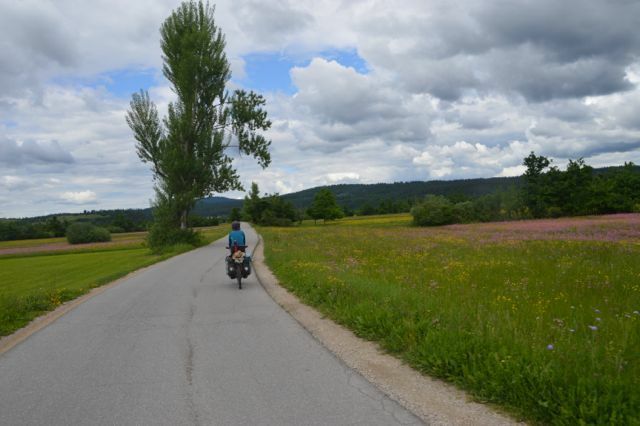 Cycling along the back roads out of Ljubljana we headed first for Skofja Loka before continuing on towards Lake Bohinj. We had hoped to make it to the lake side for nightfall but the mountainous roads had a different idea for us. Luckily the 3km of 16% gradient wasn’t as crazy as it could have been and the golden sunlight made the mountains and valleys glow. 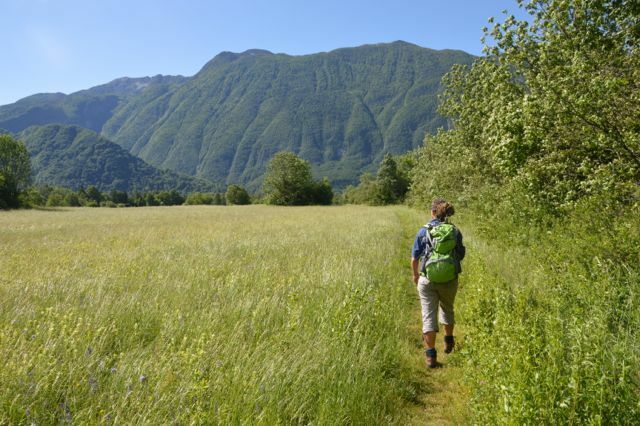 As evening approached we picked wild thyme as a break from the continuous switchbacks, collected water from the ski resort at the top and settled into a grassy gap in the surrounding pine forest. Visions of the 600 wild bears that roam the country entered my mind, but the only wildlife we saw were deer, and Jude in her fantastic glam-ping wear. The bridge over the river at Skofja Loka. Happy to be back cycling. That’s one long, hard climb to come. But the scenery is enough of a distraction. Seeing the road we climbed far below. Jude is a glam-ping queen. Back to our tent home heaven. 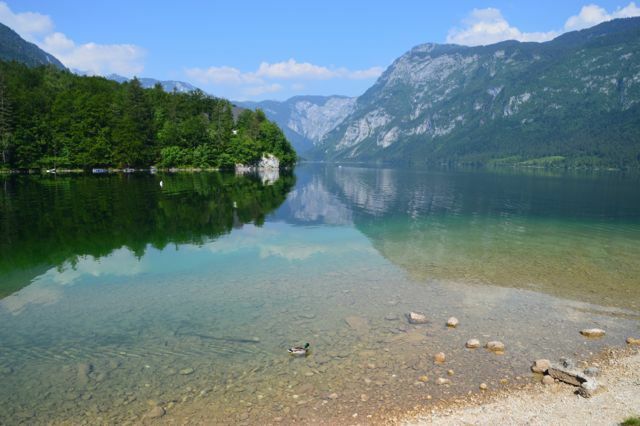 Summer lovin’ kicked off the moment we laid eyes on Lake Bohinj. Set at the end of a valley with spectacular views all around, it was the perfect place for a multi day cycling-hiking-paddling-swimming fest of fun. Our first view of Lake Bohinj. Swapped the bikes for some kayak fun. Swimming and beers to follow. Our home for the nights. A morning’s cycle delivered us to the tourist infested Lake Bled, where we enjoyed a spontaneous barbie on the shore. That’s one of the many beauties of carrying your whole life with you… We also indulged in a little secret shame we developed during our time in Slovenija – Radlers (otherwise known as a shandy). Cycling in the heat produces a great thirst that water sometimes can’t quench. Riding drunk can be fun, but not daily. So the answer we discovered was the Radler, and in Slovenija the extensive choice of citrus flavours were happily sampled. Morning mist and meditation before setting off. 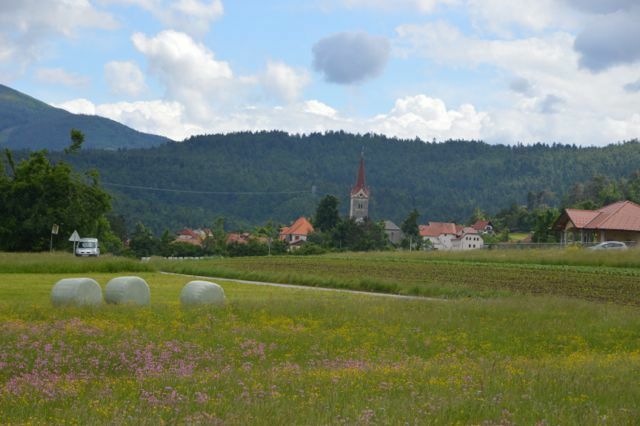 On the road to Lake Bled. Taking a break on the banks of the lake. Enjoying a spontaneous barbie and Radler party. As you’ve probably guessed we’re not that much into large groups of people and tourist towns, so after cycling a quick lap of the lake we headed off along the 658 hoping to hit the road to Austria at some point. It was another stunning afternoon as we wound our way along the foothills and through the picturesque villages. 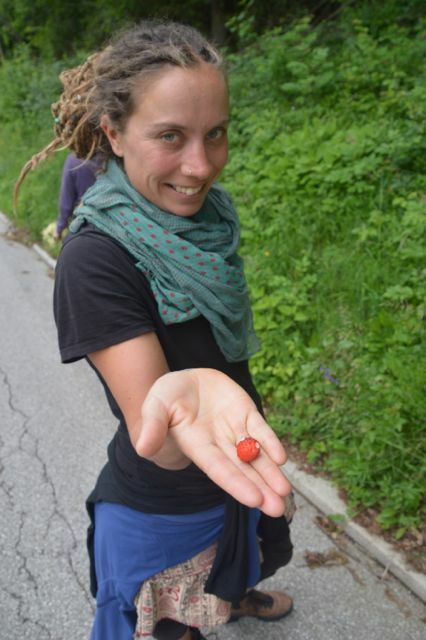 We picked more wild strawberries, drank from mountain streams and enjoyed the feeling of our bodies moving. From Trzic the old road climbs to the Slovenian/Austrian border pass (cyclists are forbidden from riding on the new road) and as the sun sank behind the mountains turning the peaks a pale purple we found the perfect pitch for our last night of camping in Slovenija. Getting changed as the temperature kept rising. Hay drying along the side of the road in the small villages. 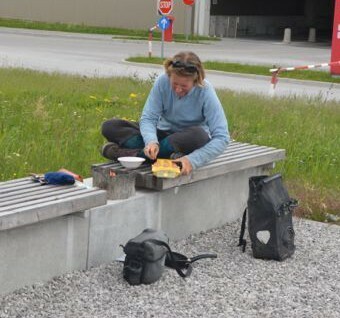 Enjoying a roadside view and snack break. 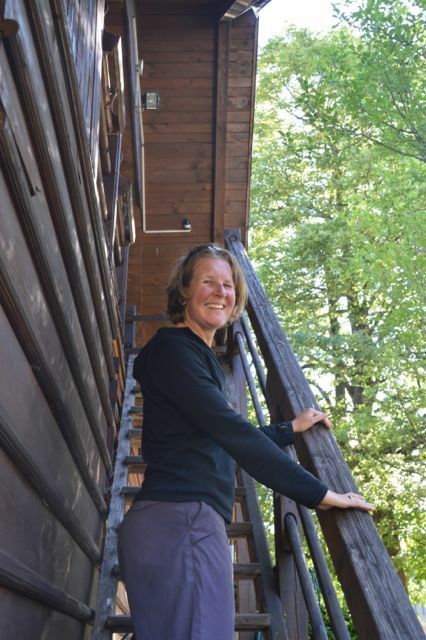 The perfect pitch – our last camp in Slovenija. Rising with the sun we continued our ascent. After a while the old road petered out and we were forced on to the new road with all its traffic. Bend after bend followed and as we have done very little hill riding over the last few months, this climb would be a good introduction for the Austrian Alps ahead of us. Leaving a roadside rest stop, we noticed a sign leading to a clearing a few feet further. Mauthausen. Jude realised the dates corresponded to those of the second world war and this piqued our interest. Nothing was noted on any of our maps, so what was this place?Well, unknowingly we had stumbled upon a concentration camp. We wandered about the ruins and remembered history as we read the memorials. One final push and we were at the mouth of the tunnel that divides Slovenija from Austria. The border is about 700m along signed with some lights and some signs. 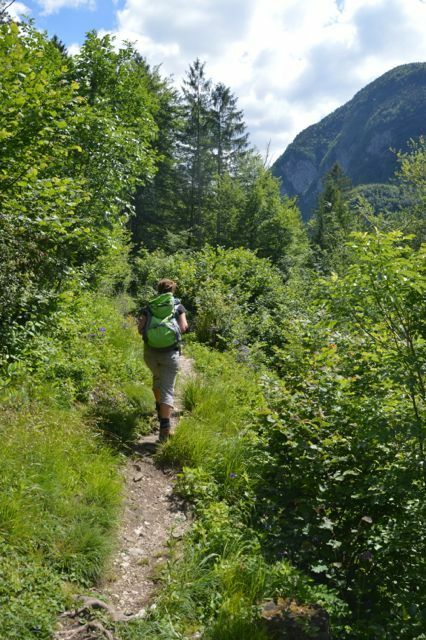 It was time to say goodbye to wonderful Slovenija. 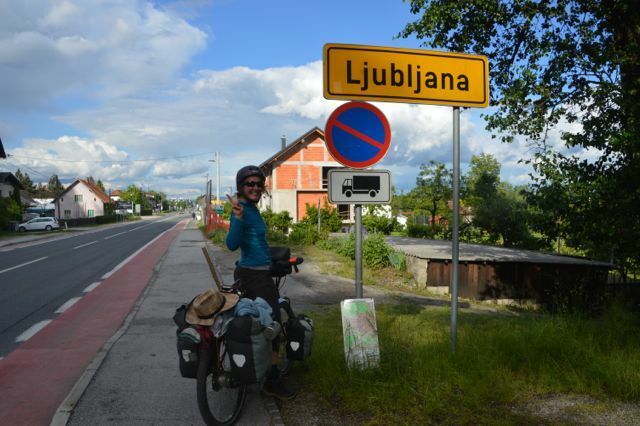 It’s a country that you could ride across in 2-3 days, but that would be doing Slovenija and yourself a great disservice. The spectacular scenery, the friendly people, the relaxed atmosphere, the vibrant capital and the good cycling all make this a great country. But there is something a little deeper and special than all of that and having spent time here we discovered it. Thank you Slovenija, thank you!